so that you can start learning right away. You can see the Lessons that are included below. Your friends and family will be delighted when they see your beautiful carvings. You will make elegant roses from beets and turnips and arrange them in a bouquet. 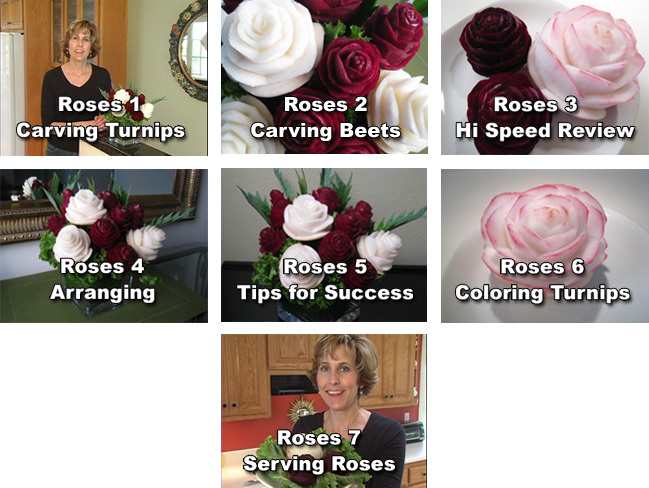 Once you know how, you can carve roses from any root vegetables. You’ll also learn how to make lovely ribbon flowers from leeks, romantic apple swans and heart carved oranges. These lessons were designed with beginners in mind. No special fruit carving tools are required. And you’ll use fruits and vegetable that you probably already have on hand. You’ll be proud of your results. Get Your Hearts and Roses Lessons Now. P.S. 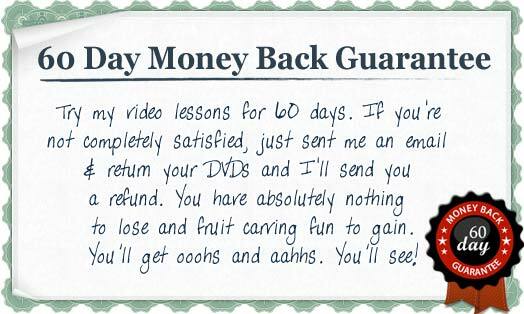 I think that you will love these lessons. If you don’t, I’ll give you a refund, within 60 days of purchase, no questions asked. P.P.S. After you’ve tried out my lessons, I’d love to hear about your results. Send photos if you like. I’d love to see them.